Sarah Rose and Osman met six years ago, while working at Whole Foods, in Chapel Hill. After about four years of dating, Osman took Sarah Rose out for a celebratory dinner one night at her favorite restaurant in town — Mediterranean Deli (she had just graduated from grad school). He told her he had a big surprise for her later, sparking Sarah Rose’s curiosity. When they got home he presented her with a large, heavy box, completely unlike the tiny one she was expecting. To her complete surprise and elation, inside the box was a huge leather-bound scrapbook Osman had made, entirely on his own (something that was quite uncharacteristic of him, as he is not much of a crafter)! The book was replete with several years worth of photos, notes, and mementos from their courtship, including some 100 post-it-notes the two had exchanged over the course of their time together. On the last page of the book was a ring, and Osman took a knee and asked Sarah Rose if she would marry him. 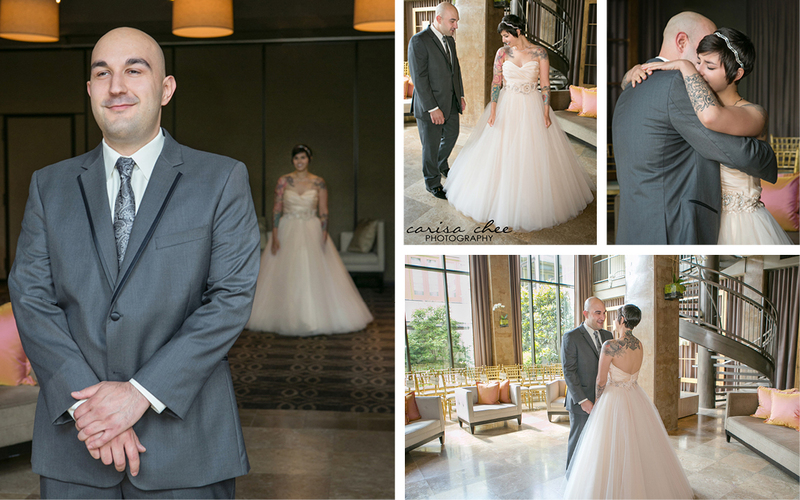 They both knew they wanted to get married at either the O.Henry Hotel or the Proximity Hotel, but after Sarah Rose and her mom took an official tour of the Proximity, she fell head over heels with the space, and loved the endless possibilities it held. After about a year of planning, Sarah Rose and Osman were married on June 22nd, before 100 close friends and family members. 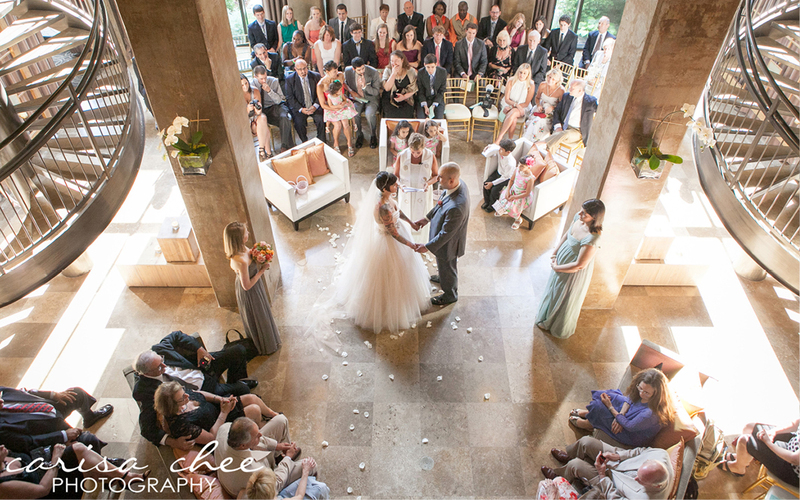 Their romantic summer wedding reflected the couple’s individual personalities, and their devotion to one another. 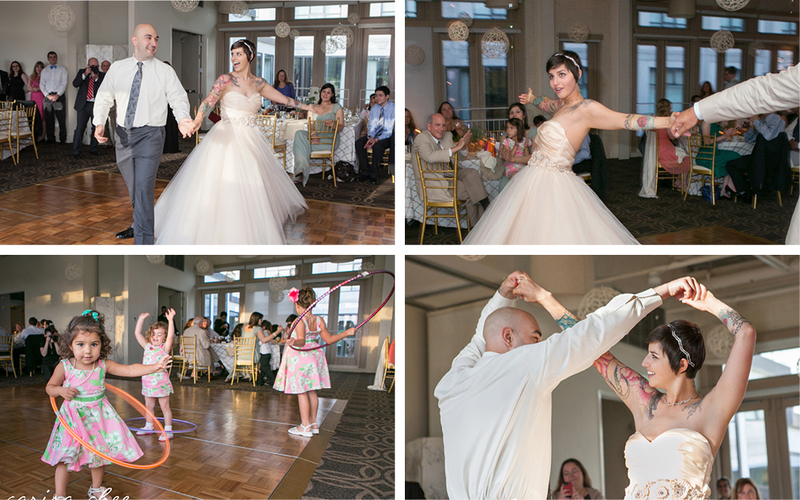 From their sweet handwritten vows, to their nontraditional music (Sarah Rose walked down the aisle to the classic oldies hit “Going to the Chapel of Love,”) to hula hooping, their wedding was iconically them. 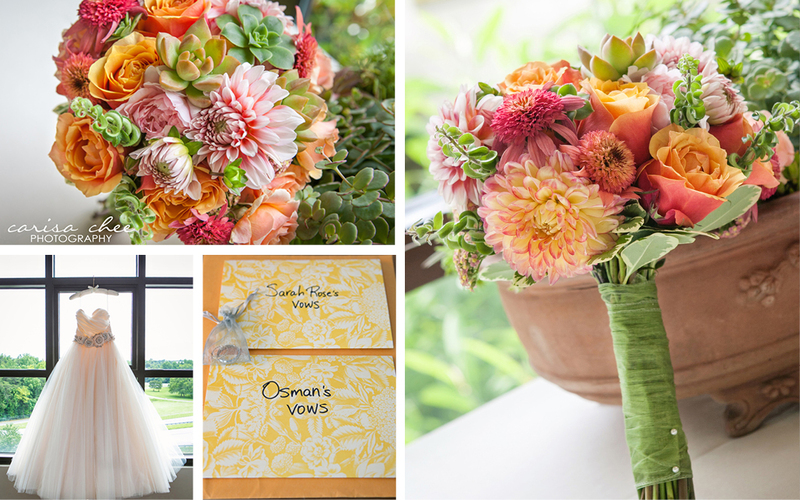 Clockwise: Echinacea, succulents, dahlias and cherry brandy roses comprise Sarah Rose’s bright bouquet; The bride’s cascading tulle wedding dress hangs in the window of one of the hotel’s suites; The couple wrote their own vows on cute stationary. The couple opted for a nontraditional ceremony-in-the-round, which created a more intimate atmosphere, and provided breathtaking vantage points for their photographer. It was special for them because it made them feel like everyone was truly a part of their big moment. 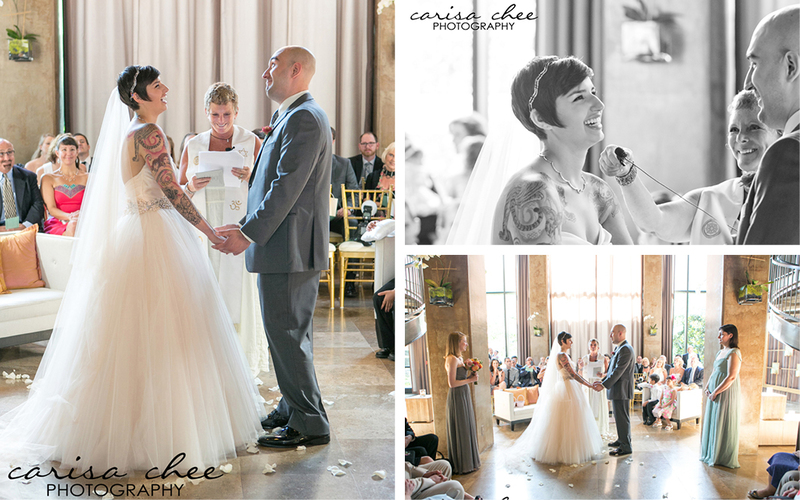 Clockwise: The couple can hardly contain their excitement once they meet at the altar, Sarah Rose reads her vows to her beaming almost husband; Natural sunlight pours through the floor to ceiling windows, during the beautiful ceremony. 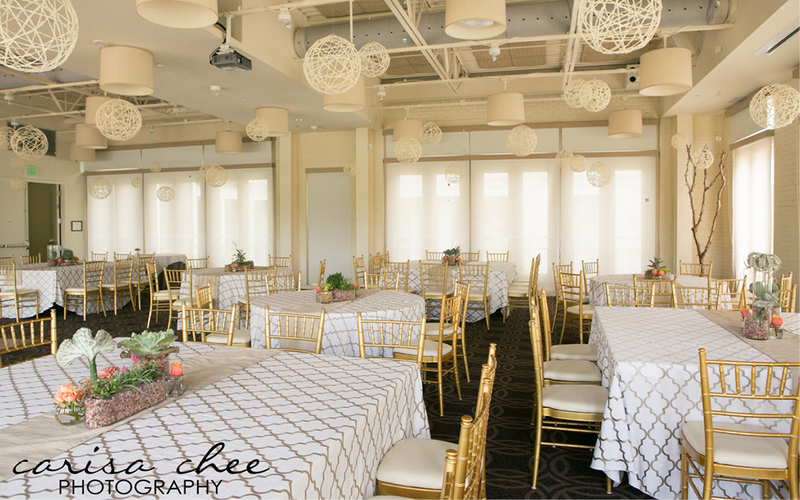 The Weaver Room was the perfect setting for the couple’s fresh and romantic reception, and featured the bride’s color scheme of seafoam green, grey and peach. 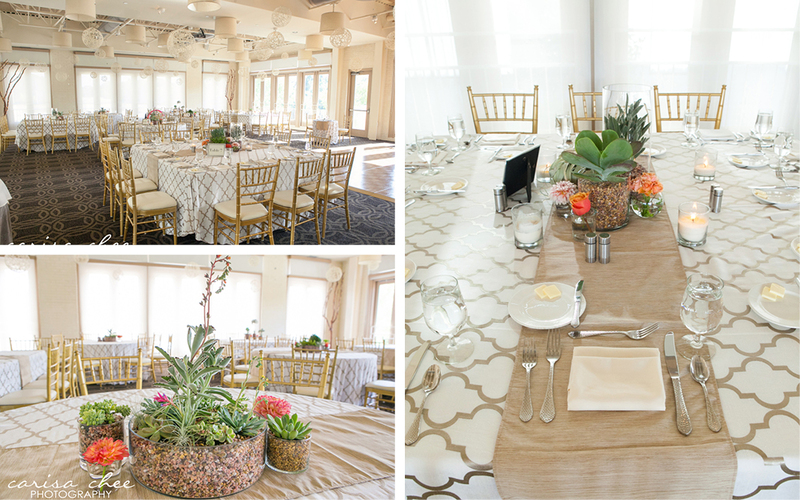 Clockwise: Reception tables in the Weaver Room were set with “Fiorenza Mushroom to the floor” linens, “Palmetto” runners and gold Chivari chairs; House florist Brenda McLamb honored the bride’s love of succulents, creating arrangements of echrverias, succulents, aeoniums and kalanchoes, accented by peach dahlias and roses, which made the tables pop. The arrangements were placed in an assortment of clear glass vases that were filled with fine gravel. 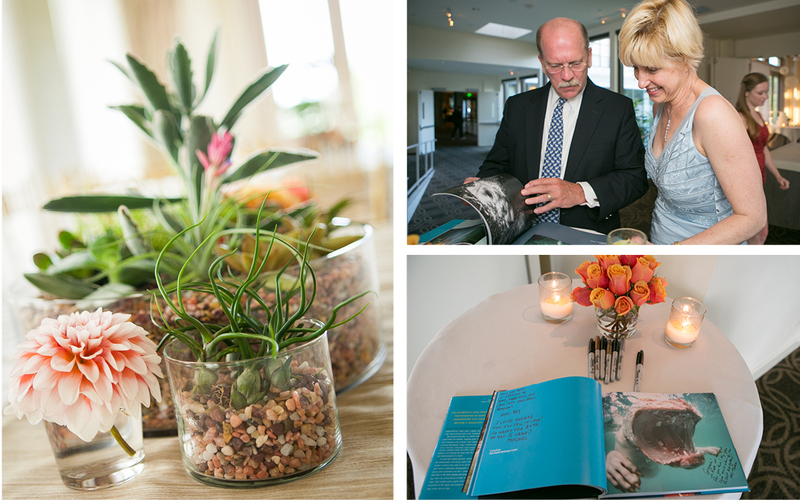 Clockwise: Gravel-filled vases of soft pink dahlias and a mix of succulents gave the tables a fresh and romantic look; Guests admire the guestbook; Sarah Rose and Osman are big fans of the photography book “Underwater Dogs,” by Seth Casteel, so they invited guests to sign it as a playful guestbook. 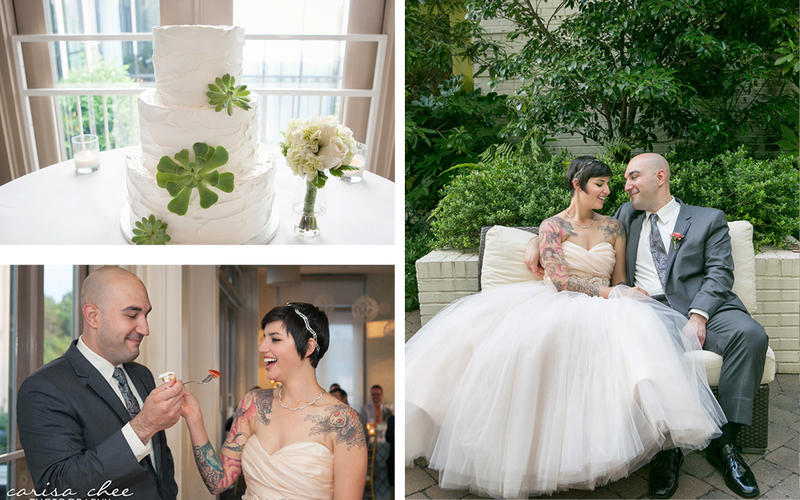 Clockwise: The four-tiered white ruffled strawberry shortcake by Delicious Bakery, with fresh succulents (provided by florist Brenda McLamb); The couple pose on a love seat outside in the Bluebell Garden; Sarah Rose and Osman are all smiles as they taste their wedding cake. 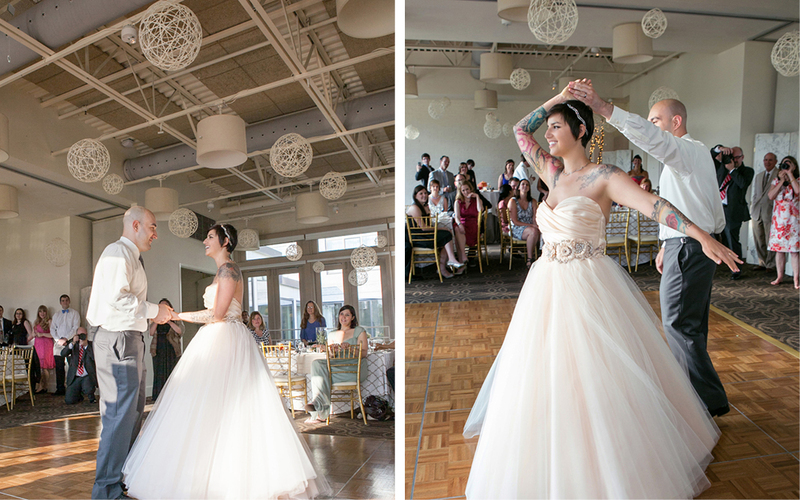 The enamored couple relish in their first dance as husband and wife. 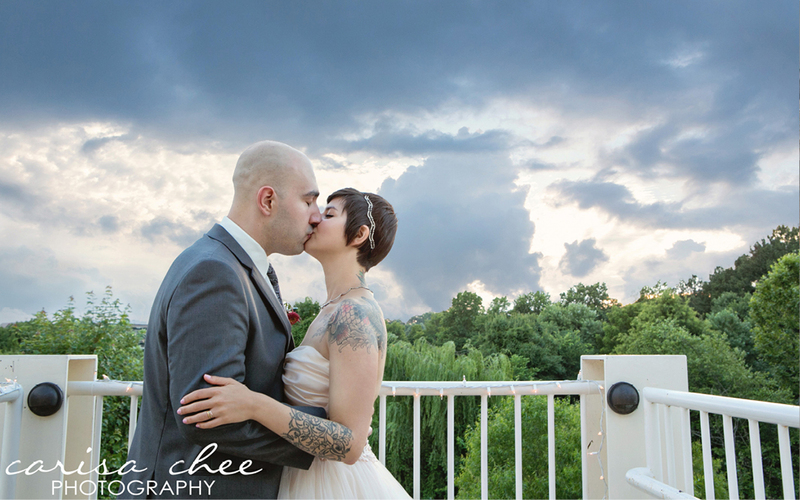 The lovebirds steal a passionate kiss on the Weaver Terrace, against an exquisite evening sky. For more information on the event you are planning in Greensboro, North Carolina, please complete our inquiry form, email our Sales Team members, or give us a call at O.Henry Hotel: 336-854-2000 or Proximity Hotel: 336-478-9111.